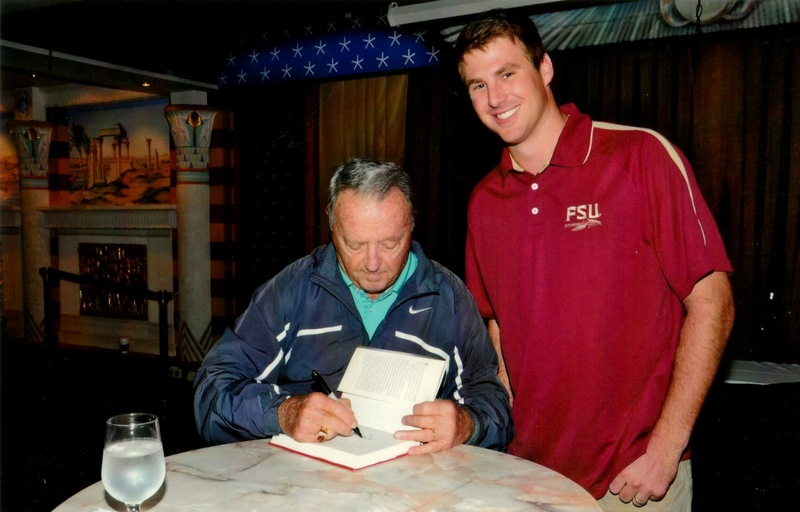 When Zach and I found out that Bobby Bowden would be the guest speaker at the Aflac Prayer Breakfast on our cruise we were STOKED. My dad graduated from FSU and while we weren’t a big football family growing up, I still considered myself a Seminole fan and even went there my freshman year in college (until a certain someone got me to transfer to VSU…). Zach has always been a Florida State Fan as well (you guys know I’d never marry a Gator!) so we both love Bobby!!! Our plan was to wear FSU gear to the breakfast and bring a bunch of stuff for him to sign. We knew we’d be stuck on a boat together so we’d have to run into him at some point right???? 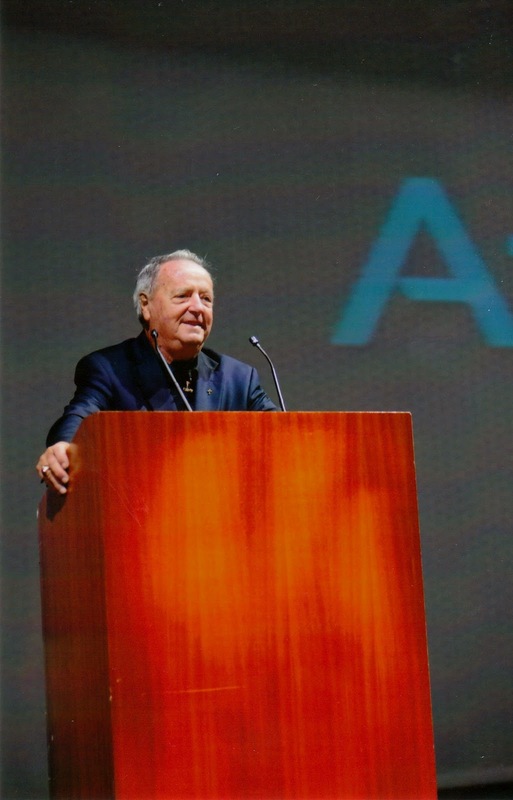 Bobby Bowden is often referred to as “the preacher” for his ability to deliver a message from both the sideline and the pulpit. I know many of you are Georgia fans and I’m sure you know that Mark Richt used to be the offensive coordinator for Bobby Bowden at Florida State. Did you also know that Bobby is the one who brought Mark to the Lord? He told us that story and how it all happened. It actually came about when one of their players got shot and killed and Bobby gathered everyone together to tell them the news and he talked about Heaven and how to insure that we all get their someday. Mark came in his office later and wanted to know more about God, isn’t that awesome? It was so cool to get to see such a legendary coach in person. He is the nations second “winningest” coach and the only one to ever lead nine consecutive teams to ten or more wins per season. He was named National Coach of the Year in 1979 and 1980, ACC Coach of the Year in 1993 and 1997, and Home Depot National Coach of the Year in 1996 and 1999. While his stories of his football glory days were wonderful, I was mostly impressed by his love of the Lord. I think so highly of Aflac for having a Prayer Breakfast and supporting speakers, like Coach, to talk about Jesus. How many companies around really do that kind of thing now-a-days? None??? Coach Bowden talked about his favorite Bible Verse (Proverbs 4:23: “Above all else, guard your heart, for everything you do flows from it”). He talked a lot about heart and how important it is to keep our heart with God and doing right. He told lots of funny stories and here is a video of one he told about when he got asked to speak at a Methodist Church (he’s a Southern Baptist). Here is another video of a cute story he told about getting a ticket in a small town outside of Tallahassee. And another video about when his now son-in-law asked about marrying his daughter. I think I managed to capture at least one “dag gummit” in there 😉 I wish I would have got on tape when he talked about the days before the “wide right” was even invented…I think the “wide right” will follow him forever! It was great to listen to him and he seemed to really enjoy talking. He kept checking his watch and asking if he was talking too much, but none of us ever wanted him to stop! 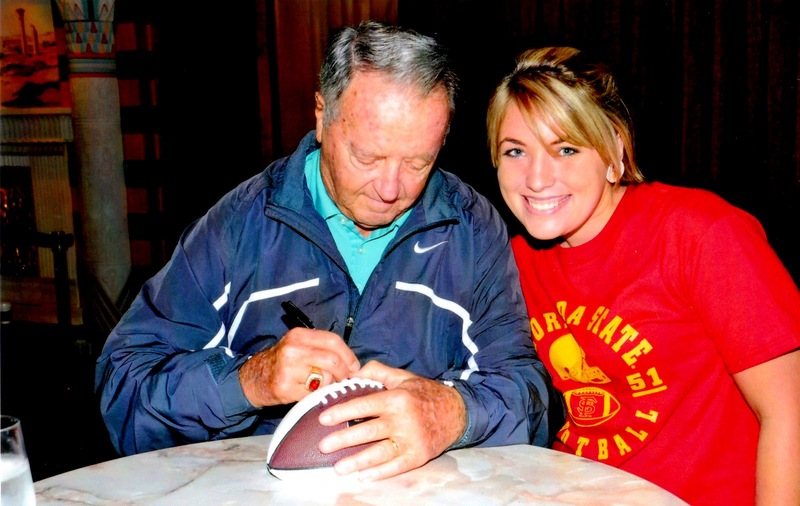 We see people like Coach Bowden as “larger than life” and not rateable, but hearing him talk about his wife and his children made me realize that he’s just like anyone else. He told us about how a drunk driver killed his son-in-law and grandson and about how blessed he is to know, without a doubt, that they are both in Heaven. After he spoke they announced that he’d be doing a book signing (Aflac hooked us up with a FREE copy of his new book: Called to Coach) at 1:00 so we got there an hour early to be one of the first in line. We brought all our stuff for him to sign (the book, a football for Zach, a football for Matt, and a football for Kye that we got at the FSU game awhile back). The guy who was in charge of the whole thing was on quite a power trip though and said that Bobby would only be signing the books! Grrr!!! At least they did take pictures for us!!! This was what I had to wait for before posting…how AWESOME was this opportunity? Zach is not into famous people at all but he admitted later that he was so nervous. They talked about all the great athletes in Valdosta and how Coach has been up here many times recruiting. I told the guy in charge that I didn’t have a book (which was true) so why couldn’t Coach sign my football (for Matt!) since it takes just as long to sign a football as it does a book, ya know? I think my girly charm helped me out! I was PUMPED to talk to Bobby and he asked me about my shirt right away and if it was a FSU one and I said yes and that my dad went there and so did I and he asked if I live in Columbus now (I’m assuming b/c Aflac is based out of Columbus). I said no, that I live in Valdosta and he said “well we’re neighbors!! !” Can I come borrow some sugar sometime then? haha! I totally rubbed his back during this picture too, I mean he’s mega famous – I wasn’t about to not touch him somehow!!! We heard rumor that once the crowd died down we could go back to see him again and have him sign more stuff for us. Zach went back and caught him JUST in time and was one of the last people to see him. And he signed (and personalized!) the other footballs for us!!! The book is “mine” and Kye’s football for him! Next Post Are you ready for some COLOR?! ?